Ray Flores, L.J. 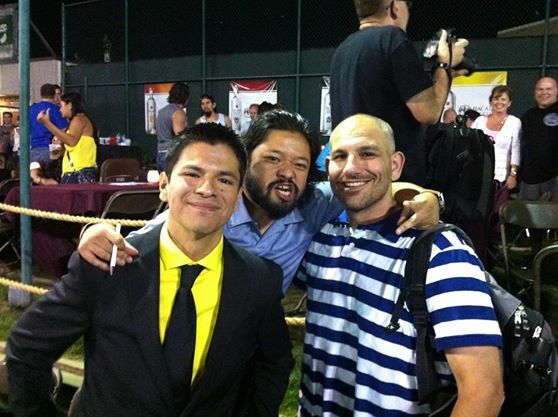 Tabano and Matt Lo Cascio at XFO Outdoor War in 2013. Chicago’s MMA was formed in 2008 by L.J. Tabano and Matt Lo Cascio, and began publishing news and articles in 2009. Tabano and Lo Cascio worked together on the Chicago-based MMA TV show “Combatwire,” which featured Felice Herrig and Jim Lynam as hosts. The show covered local personalities and events, and also featured technique demonstrations from esteemed MMA veterans like Bas Rutten and Miguel Torres. Tabano was the main producer on the show and Lo Cascio created the on-air promotion and interstitial elements. Both continue to work in the news/media industry in Chicago, and they have created content for TV, radio, web and print. The goal of the site has always been to report news and promote local MMA fighters, schools and events while adhering to the highest standards of journalism and fairness.